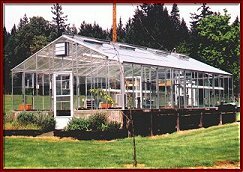 Category: Commercial Lean-to Home Attached Lean to, Lean-To Home Attached, More..
Commercial building attached lean-to greenhouse quotes are welcomed. We can provide you with quotes on any sized commercial lean to, from the very small up to the very large in both our Traditional straight eave series or our Pacific curved eave series. With over 8,000 styles and models to choose from, including single or double glass, 6mm twin wall polycarbonate or our new improved five wall polycarbonate, the possibilities are endless! 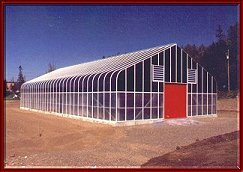 Below are a few samples of commercial greenhouses and commercial building attached lean-to styles. A brief description of each photo is directly underneath the photo. 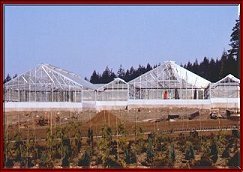 Click here to view some of our commercial greenhouses. Greenhouse complex at UBC Botanical Gardens, Vancouver B.C. This slanted sidewall green house was designed for a technical institute. It also features continuous roof venting along the ridge. 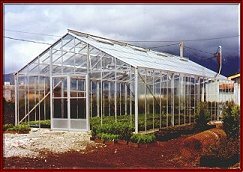 This free standing greenhouse measures 20' x 50' and is popular with both hobby and commercial growers. 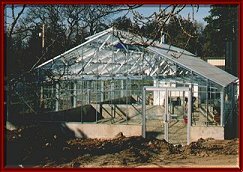 Greenhouse measuring 20' x 40' with single glass, roof venting and double doors. This greenhouse, built for a garden center, measures 20' x 70'. It features 6 mm laminated roof glass, and roof and side ventilation. 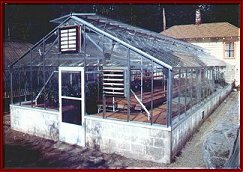 Traditional greenhouse designed for an Institute. It measures 30' x 80' and features double store front doors. 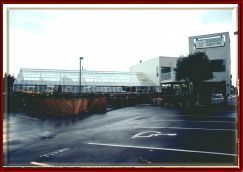 This research greenhouse was designed for the Fisheries Department. The aluminum frame is glazed with a 6 mm bronze polycarbonate cover. 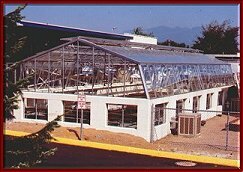 Continuous roof venting, louvers and intake shutters were the specifications for this 20' x 40' all glass greenhouse. Free door drop is provided if the structure is being built up on a knee wall, as shown in the above photo.